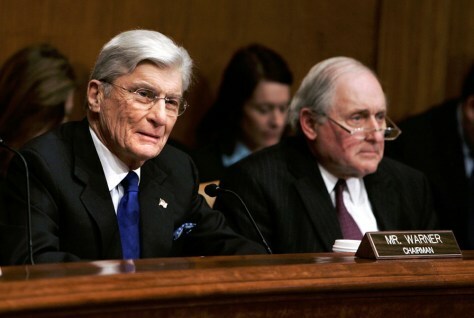 Senate Armed Services Committee Chairman John Warner (R-VA) (L) seated next to incoming committee chariman Sen. Carl Levin (D-MI), is expected to begin today's confirmation hearing for Sec. of Def. nominee Robert Gates, with a call for President Bush to include Democrats in formulating Iraq war strategy plans.